Apparently, the OB Entryway Sign is in trouble. 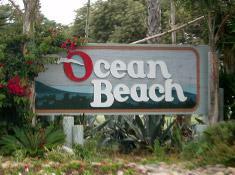 The OB Town Council reports that the sign has weathered years and years of coastal air and an army of termites has moved in – it must now be replaced and they are seeking residents’ input and design proposals for a new sign. OBceans are urged to contact artist friends and family members to draft what they would like to see and submit it for consideration -even if what is wanted is the exact same sign, only with different materials. Submissions should be emailed to CreativeDirector@OceanBeachSanDiego.com. Call 619-224-4906 with questions or concerns. After all of the design proposals and other feedback/comments have been received and sorted, the public will have the opportunity to weigh in on the proposed plans and “vote” on their top choice(s). Sign looks great. I’ve been a carpenter/contractor for 25 years. Big difference between “needs to be replaced” and “we want to replace it”. not opposed to some change but let’s be real about the motive. More importantly, let’s keeo the new beach bathrooms clean!